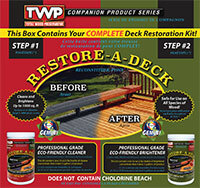 When cleaning Wood or Decks, use the Restore-A-Deck Kit. This will open the pores and remove any graying and or dirt. This is important even for new wood. New wood has a mill glaze that should be removed prior to any stain application. For removal of old stain see Wood Stain Strippers. Apply the Step 1from the Restore-A-Deck Kit following manufacturer's directions. Most cleaners can be applied with a pump-up sprayer. The cleaner should dwell on the wood for 5-15 minutes. Make sure that you mist the deck with water if it starts to dry. Use protective clothing, glasses, and gloves. Pressure Wash or Hand Scrub the wood to remove dirt, graying, mold, mildew. If there is a previous coating and it starts to come off unevenly, then you may want to consider using a Wood Stain Stripper. This will ensure a more even appearance when stained. When done washing take time to rinse all wood, home, vegetation, etc to remove the cleaner residue, grime, and wood fibers. Use Step 2 from the Restore-A-Deck Kit to "brighten" the wood and neutralize the cleaner back to the proper pH balance for the wood. This should dwell on the wood for 5-15 minutes. Once done make sure to rinse the wood, home, vegetation, etc. Wood should dry for 48 hours prior to applying a TWP Stain. When removing a failed transparent wood or deck coating it is needed to use a Wood Stain Stripper. This will soften the old coating allowing easier removal. Note: It is need not needed to do Step 1 Cleaning if you are using a Stain Stripper. Apply Wood Stain Stripper following manufacturer's directions. Most deck strippers can be applied with a pump-up sprayer. The stripper should dwell on the wood for 10-15 minutes. The wood will "darken" in color during this process. Make sure that you mist the deck with water if it starts to dry. Use protective clothing, glasses, and gloves. We sell environmentally friendly products but they can still cause a reaction to skin and eyes.